A computer screen has its own 2d coordinate system that allows the software to display objects at a certain location on screen. The iPhone's screen is 320 points wide by 480 points high. The top left corner is the origin (x=0, y=0). 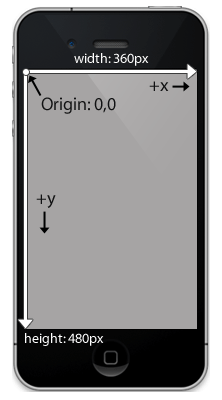 Positive values of x go right across the screen, while positive values of y go down the screen. 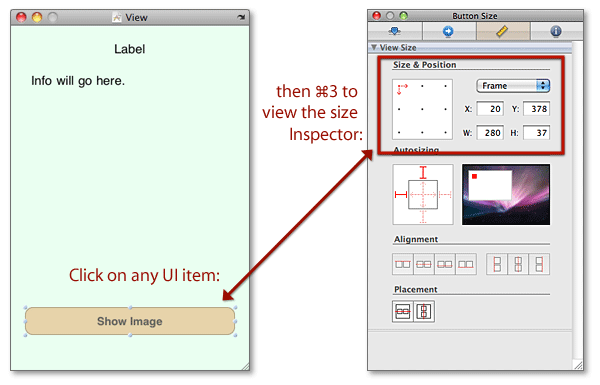 You can either drag the item around on screen, or type new numbers into the x/y/width/height boxes in the size panel to resize or reposition an object. The frame is the outer container for the view - the position of the item within its enclosing superview. The bounds rectangle determines the origin and scale in the view's coordinate system within its frame rectangle. Setting this property changes the value of the frame property accordingly. When you set the frame property, the size of the bounds property is set to match the size of the frame property. The center property is also adjusted to match the center point of the new frame.